Article first published as A Trip To Italy With Jamie on Technorati. Is it still necessary to present Jamie Oliver? The talented chef, who started his career at Neal’s Yard and The River Café before setting up on his own, has become a star. Restaurants, TV shows, a foundation, campaigns to promote healthy eating, kitchen accessories and food range, the list is endless. Of course, there are the cookbooks. Almost twenty of them. One of my favourites is “Jamie’s Italy”. It starts with the book cover. Jamie may be English, but it looks like his heart belongs to Italy. The chef is obviously very relaxed, sitting outside on a red stool against a wall whose paint has seen better days, his foot propped up against an old Fiat Cinquecento. He is eating spaghetti coated in a tomato sauce, and the expression on his face says it all. It gives you the urge to open the book and start cooking straight away. To gather the recipes, Jamie embarked on a tour of the country in a VW bus with a kitchen built in a trailer, allowing him to easily cook wherever he stopped. Tuscany, the Marches, Sicily, etc, Jamie clearly had a genuine and deep connection to the people he met during his peregrinations, as the photos attest. A lot of smiles and hand gestures going on, and touching moments such as Jamie observing an old man repairing his fishnet, pouring a glass of wine for a shepherd or making pasta with four generations of women. When I browse through this publication and take the time to look at the pictures, it makes me want to visit the night markets of Palermo to taste these chickpea fritters or to enter a pasta competition in Le Marche! 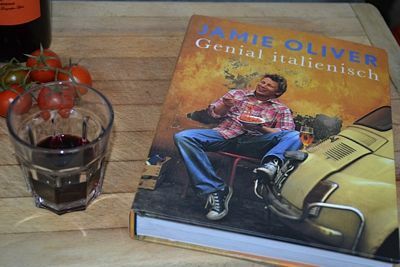 “Jamie’s Italy” focuses on authentic, mouthwatering food, best eaten with family and friends. Italians “Mamas” revealed their pasta making secrets to Jamie and owners of “agroturismo” inns welcomed him into their way of life. The warmth of the exchanges Jamie had with locals also transpires in the writing and the way the recipes are introduced. Yes, this love of food and sharing makes its way into your home too. I have yet to try all the recipes, but the ones my family and I already prepared received high praise, from us as well as from our guests. Needless to say, only empty plates and dishes were returned to the kitchen.